The Cedar Valley Junior and Pee Tour Championships take place June 28-29 at Pheasant Ridge Golf Course and Walters Ridge Golf Course. The Cedar Valley Junior Championships is a two-day Major point event. The Cedar Valley Pee Wee Championship is a one-day event being played at the Walters Ridge Golf Course. The Iowa PGA will also be hosting its second Drive, Chip and Putt local qualifier at the Pheasant Ridge Golf Course on June 29. Click here to view start times. 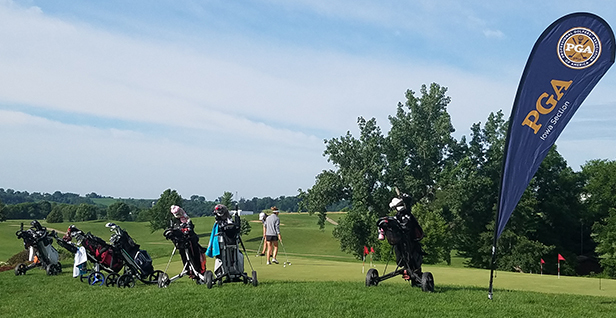 The Iowa PGA is expecting to have over 150 junior golfers at Pheasant Ridge on Friday between the two tournaments and Drive, Chip and Putt! The Woodland Hills Junior is also being held on June 28 at the Woodland Hills Golf Course. Click here for more information. The Junior Tour Classic at Indian Creek and Indian Creek Pee Wee take place Sunday, July 1 at the Indian Creek Country Club. Today is the final day to register for this event. Click here to register. The final qualifier for the 43rd Boys Iowa Junior PGA Championship will be held on Monday, July 2 at the Ellis Park Golf Club. Click here for more information. Registration for the Legacy Junior Academy Invitational closes today at 11:59 p.m. Click here to register. The last day to register for the Iowa City Junior at Brown Deer is tomorrow. Click here to register. The Boys/Girls Junior Tour Mid-Summer Classic and Pee Wee Mid Classic are being held in conjunction on July 5-6. The last day to register is July 1. The 43rd Boys Iowa Junior PGA Championship is being held on July 9-10 at the Indianola Country Club. Two boys from the 16-18 age division will advance to the 43rd Boys Junior PGA Championship on July 31-August 3. The final day to register for this event is Thursday, July 5. Click here to register. The Iowa PGA will be administering the John Deere Classic Pre-Qualifiers and Open Qualifier. The pre- qualifiers will take place July 5-6 at the Pinnacle Country Club and Short Hills Country Club. Registration for the pre-qualifiers closes today at 11:59 p.m. The John Deere Classic Open Qualifier will be held at the Pinnacle Country Club on Monday, July 9. Registration for this event closes Friday, July 6. Qualifiers from the pre-Qualifiers will be automatically entered. Click here for more information. The next Iowa PGA event on the 2018 schedule is the Iowa PGA Pro-Junior. This event is scheduled for July 16 at the Brown Deer Golf Club. Teams will be comprised of one Iowa PGA Professional and three juniors. Click here to register.